The Lento Law Firm was founded and is guided by attorney Joseph D. Lento, who has spent his professional career passionately advocating for his clients; bringing to the table nearly fifteen years' experience helping families. 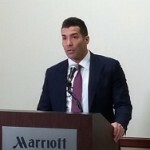 Moreover, as an attorney, Joseph Lento dedicated his law practice to the work he started years earlier, and he has spent nearly a decade representing Family Law clients throughout Pennsylvania; including, but not limited to, those with Family Law matters in Philadelphia, Montgomery, Delaware, Bucks, and Chester County. Nothing is more important to Joseph Lento than family, and he advocates for his clients not only with this philosophy in mind, but also in his heart. Joseph Lento does not merely settle for the easiest outcome, and instead prioritizes your needs. Well-versed in the effective use of diplomacy, he has successfully handled countless complex and sensitive negotiations where the stakes are always high. Joseph Lento will also not be intimidated in the face of adversity, or those with positions contrary to his clients. Ultimately, he will do whatever is necessary to ensure that your Family Law needs are met, and your interests protected.